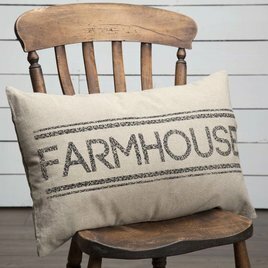 The Sawyer Mill Farmhouse Pillow has a grain sack stripe above & below the wording, stenciled in distressed black, across the center. Reverses to charcoal grey, chocolate, & creme striped & 2 light wooden button closures. 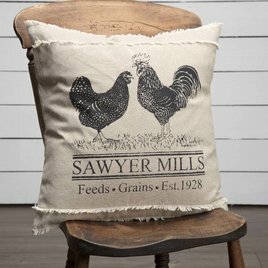 For a vintage prairie inspired look, try the 18x18 Sawyer Mill Poultry Pillow. Over it's all cotton khaki chambray is a rooster-themed black stencil in the center. Reverses to solid khaki chambray and 2 tie closures. 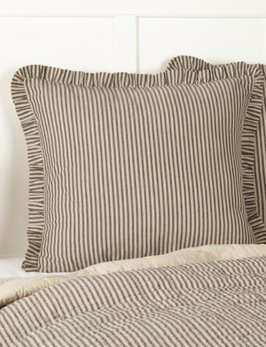 The Sawyer Mill Charcoal Ticking Stripe Fabric Euro Sham with repeating, black ticking stripes woven into dark creme cotton base fabric & is finished with a 1.5 inch self-gathered ruffle - reverses to same as front. Classic farmhouse colors & stripes. 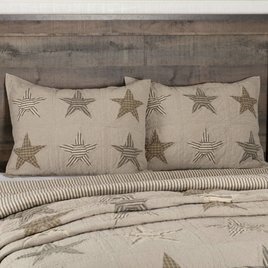 The Sawyer Mill Star Charcoal Pillow Sham completes your Farmhouse look! Showcases 6 country stars, alternating in a variety of colored fabrics on textured solid chambray cotton base. Reverses to multicolored grey grain sack striped cotton. 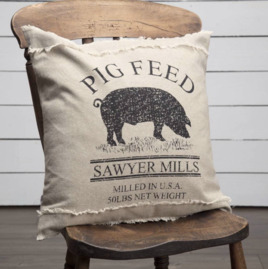 The 18x18 Sawyer Mill Pig Pillow brings your home farmhouse style with it's black stenciling of a pig theme on a khaki chambray base with two rows of fringed seams on the top and bottom. Reverses to solid khaki chambray and finished with 2 tie closures.